I cannot believe the first semester is almost over... where did the time go??? For many of us, the end of a semester means ASSESSMENTS...YUCK! We can see the growth ALL of our kiddos have made even if the assessments may not reflect that. I really wish the people who force us tell us what assessments we have to give need to give had a clue about what a typical 1st grader is like. They write this curriculum and have NO IDEA who the audience really is! I am all for teaching more rigorous thinking but that is not taking into consideration who the child is and what they bring with them into our rooms. To me, I have FAILED a child if I have not taught them to be more compassionate, helpful, and respectful. Yes, many of them come with so many burdens and a home where those qualities are NOT taught. I understand those tough situations do not make an excuse for a child's behavior but does help explain it. If we don't teach them that there is a better way, the cycle will continue. Yes, I teach my curriculum but I also teach a unique and precious blessing who deserves to be a child and learn through playing, singing, exploring, and laughing. If I forget to look at that child with Eyes of the Heart than I am not teaching that child. Because if I want to teach that child I must first touch a heart! Wow! That is beautiful and so true. I am printing that to hang behind my desk as a daily reminder. Thank you. I just awarded you the Sunshine Award! 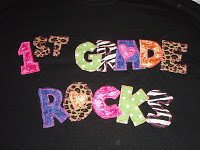 I have 2 of their t-shirts btw & I love them! I always love what you write!! This one I'm printing and giving them to my fellow teachers. Thank you! I LOVE your t-shirts. Do you sell them? Please let me know. I couldn't agree more with your post. Thank you for writing it. So many times these assessments are not even developmentally appropriate, and as you said, so many kids come with burdens and from broken homes. It saddens me when a child "fails" a test, often by ONE point, and the child and parent has to see that. What about the progress they've made?!? Last year I had an ESL child who came to me reading 20 wpm when the goal was 60 wpm. Well, by the end of the year he was reading over 70 wpm when the goal was 90 wpm. He didn't always pass his reading assessments, but I was so proud of him! He was a success regardless of what the scores say. :) Well said. 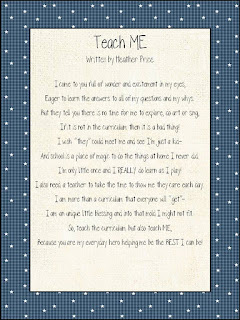 Your poem sums it all up... Wouldn't it be nice if *they* understood what teaching/growing/exploring/learning/developing is all about? Teaching is a calling. There is so much more to it than presenting curriculum and assessment. Sadly, the *theys* who have chosen decision making positions must not have had motivating and impression-making elementary teachers; if they had, they would understand and value the importance the true magic of it all. I just love this post! I think it is so important to keep the pure *child* in mind when we are teaching. Your students are lucky to have you! It really is amazing what relationships can be built in a classroom with a philosophy like yours. I just started my own blog a couple of weeks ago that I would love for you to check out if you have time, a couple of freebies and a super important post on bullying! Heather your comment was so sweet. I hope you don't mind but I linked this page to a post I did tonight. I really needed to read some of your poetry after today....so please know it makes a difference. I love this post! It is so true, I feel like I am always preparing my kids for a test and not for the real world. I am printing out the poem for our newsletter.